Francisco’s debut album from 1982! Available now exclusively from this Analogue Rock Records – click here! 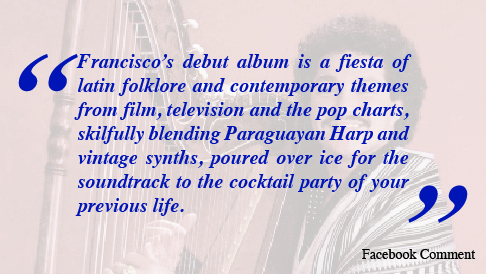 “Shimmering Harp” was Francisco’s first recording after going solo in the late 1970s. Recorded between 1980 and 1982 at Stockport’s legendary Strawberry Studios, the album mixes traditional Paraguayan folklore (Bell Bird, of course), Francisco’s own compositions (a breathtaking version of Vamos Amigos), pop covers (McCartney’s Yesterday) and TV & Film Soundtracks of the day (Theme from M*A*S*H, The Godfather, Never on Sunday). 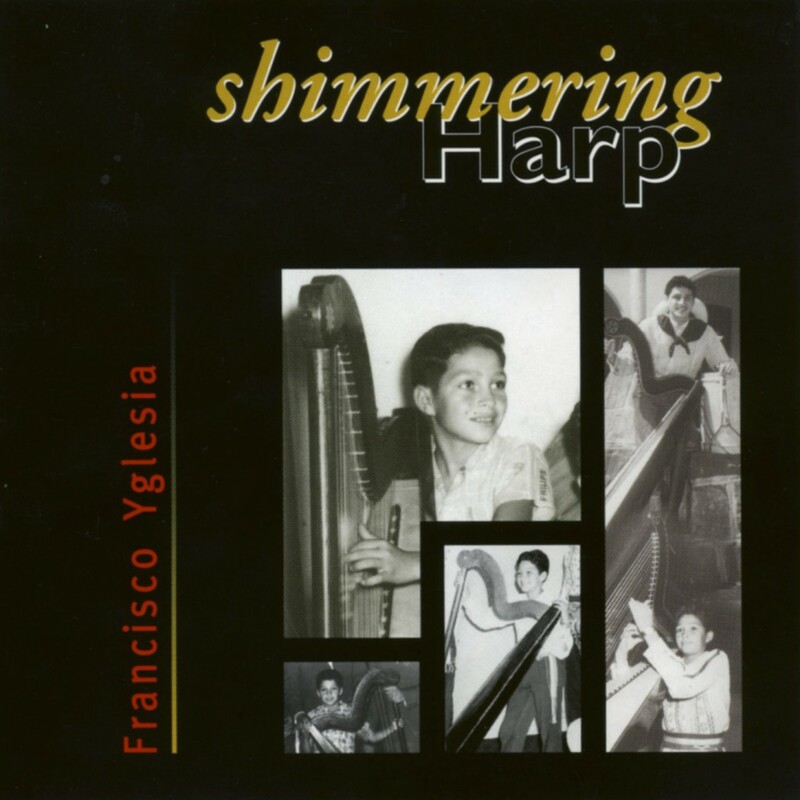 Also making its debut here is an early version of the title track Shimmering Harp, which would become one of Francisco’s most popular tunes. Whilst Bell Bird and Cascada are solo, the rest of the album is a concerto backed by live guitars & percussion, and synthesisers that would now be described as “vintage”, providing a cocktail-lounge ambience that a contemporary indie band could only now dream of. The result is a fascinating period-piece that has stood the test of time, if best served with with a Babycham in a frosted glass. It was released on the “Music for Pleasure“ label on vinyl and cassette (this was before the age of the compact disc), so if you have an original copy, you have a rare collectors’ item! 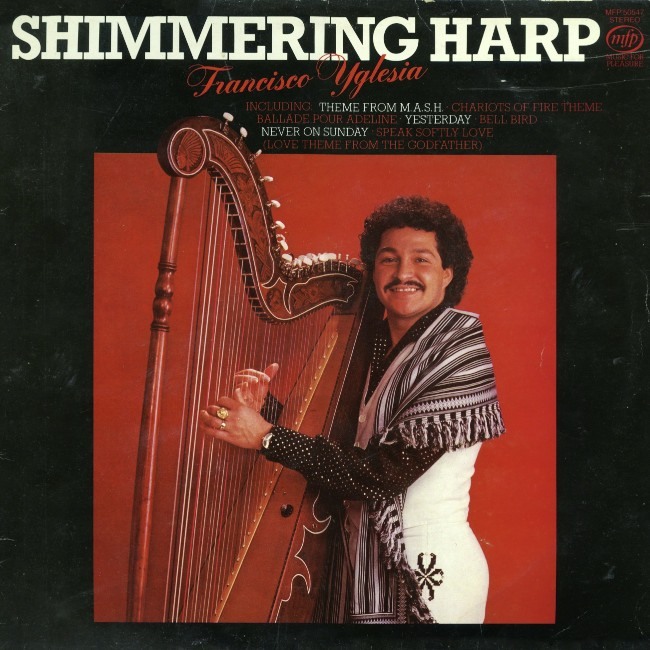 Shimmering Harp: The original 1982 vinyl album sleeve. The album was pressed to compact disc some years later with new artwork (featuring images of Francisco’s childhood), but these too have have become collectors items, with a second-hand one currently for sale on Amazon.co.uk for almost £100! Please, don’t pay that much! We have recently unearthed a handful of CD copies of Shimmering Harp, which are available for sale exclusively from Analogue Rock Records! Please note, the Shimmering Harp album is not available as a digital download, and there are no plans to make it so, as unfortunately it is out of our control. However, four of the tracks from this album were re-recorded by Francisco in 2009 for his album Este es Francisco Yglesia, which is available on iTunes.